On Friday, Valve posted on the Steam Blog that Steam Greenlight will finally be replaced by a new system for game developers to submit their games to the digital distribution platform. The new system will be called Steam Direct, where a developer can fill in a set of digital paperwork (such as company, tax and bank information) and pay a fee for each game they submit, with a small verification process to ensure that games will be able to run properly through the platform. With this news bringing heated discussions among game developers and journalists, I figured I’d put all my opinions down on one post to give my side. While I have Steam Greenlight to thank for giving Gemstone Keeper the chance to be on Steam, I feel that Steam Greenlight has a lot of issues and is an easily cheatable system. It can make a game developer’s efforts a bit demoralising when they work hard on a game, pay the fee and spend time to create a good description and video to be placed on the page, when among the other hard working developers who put as much effort, you are also competing with people who either flip pre-made assets onto the store and could easily rack up votes by offering free Steam keys. Doing things the right way, as I talked to students about at a Staffordshire University conference months earlier, might take a few days if you are lucky, but more likely take weeks, months or (in a few cases) years to get greenlit, if you are greenlit at all. The idea of having a fee per game, instead of a fee per account, is not new. It’s been suggested even why back when the idea of replacing Greenlight was first mentioned by Valve back in 2013, and I’m one of the group who agreed with the idea. This means that I was initially glad to see Steam finally announcing Steam Direct with this fee approach. It’s also worth mentioning that Steam has said that all games which have been greenlit, but have yet to be released, will not be affected by the transition and that it is possible to get a refund of the Greenlight submission fee if you do not have any Greenlit titles. That being said, there are some concerns, namely with the vague and limited description of the approval process. While it’s all good to ensure that games released will actually contain an executable required to run the game, the question of quality arises. I’ve heard some ideas that a full vetting process would mean some really creative games would get rejected, which I do find valid since the appearance of a game is subjective, but I’d disagree on the fact that having a game that is quirky or unusual in appearance would still get through as long as it can run smoothly with a good framerate on average hardware and would be difficult to crash or bug out. It’s a concern to bring up, since part of the reason why Steam emassed such a large amount of poor quality games is because they allowed poorly made games to get through. We talked to several developers and studios about an appropriate fee, and they gave us a range of responses from as low as $100 to as high as $5,000. There are pros and cons at either end of the spectrum, so we’d like to gather more feedback before settling on a number. While a lot of developers are either worried or accepting of the maximum fee, citing either eliminating low income developers and developers from third world countries, I’m gonna be sounding like the optimist and say I doubt Steam would ever set the fee at $5000, unless they fully accept the risk of alienating a large amount of aspiring developers and reverse the progress of allowing indie development to be more accessible to bigger platforms. However it is because of reasons given like the fact that Valve and Steam are a business, submitting games has its own costs and there is a risk on Valve to allowing several games, especially if it’s unlikely they’ll make any money on the platform, that I do not see $100 being the fee they’ll decide on. Based on the several discussions I’ve read and the majority of developers preferring a lower fee, my best guess is that whatever fee Steam decides, it will not exceed $1000, maybe not even $750 if it would deter anyone who wants to use Steam as a way to make money with little effort. Some have even suggested that the fee will bring a rise to smaller marketplaces for indie developers, as even Itch.io even joked about. I like seeing more variety, and I’m happy to see platforms like itch.io, GOG, GameJolt Marketplace and the HumbleStore growing their own communities, it would still take a few big named publishers to move to these platforms to topple Steam over. Finally, I want to give my view to a point made by Jonathan Blow, who made a series of tweets criticising game journalists who write about Steam Direct being a reason for Indie Developers to panick, and not considering views who are on-the-fence or approve of Steam Direct. I don’t entirely agree with his viewpoint, in particular I don’t think it’s correct to think Kotaku/Polygon’s potentially biased reporting on the Steam Direct based on actual sources and “fake news” to be the same. However, considering that it’s only been a weekend and not every bit of infomation on Steam Direct has been finalised, I don’t think it’s good to treat every bit of detail in the Steam Direct announcement as negative, considering this is one of the first positive steps Valve has made in a while regarding Steam in a while. The results are online and I’m confident in saying I have improved once again! As you can see, not only have I achieved the 100% Coolness ranking for the second time, but in all but one of the categories I have managed to reach the top 500! Compare this to Ludum Dare 34 where I only had one category in the top 500 (but then again, I didn’t do much effort and only allowed voting on four categories), and Ludum Dare 33 where despite having a better ranking in audio and fun, four out of the eight categories failed to reach the top 500. So in a way, I’ve improved overall. I’m still aiming to get a category in the top 100 though, I was so close last year. You can play my LD35 entry here on itch.io! I would make this my obligatory “I’m in” post, but I thought I’d make this a bit fun and tell you some weird or crazy fact when it comes to me and game jams, and in particular Ludum Dare: I’m cursed. Now here me out, I am aware this sounds weird and possibly crazy (because it is), but even if it’s just a sheer coincidence or just bad luck, there is an unusual pattern that has occurred whenever I take part in game jams, and this has been happening through most of the game jams I’ve taken part in since 2013. The “curse” goes as follows: Every game jam with an even number will either lead to no completion or failure. 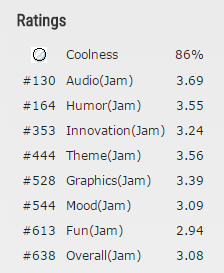 That’s not to say that the jams with odd numbers have lead to roaring successes but the majority of my game jam participations which lead to finished and submitted games and some have had much more positive reception than I’ve hoped for, which is saying something for someone who hasn’t (yet) reached the top 100 in any Ludum Dare category. Heck, on my own Ludum Dare author page there are only entries from odd numbered LDs. So if you are interested, I will show you my evidence and also add in some lessons that were taken from them. Most of why this jam went wrong for me can be summed up in the post mortem I wrote. The short version was that I was collaborating with another person, and we left pretty much everything from what tools we would use, to our game jam idea to the last minute, and as a result we made an unfinished game that we felt embarrassed to keep online so I reached out to Ludum Dare to have that game removed. I don’t have any criticism to give Code_Assassin, but we pretty much agreed that if we were to collaborate again, we’d definitely need a week or so to prepare what games we could make and what tools we would use. Lesson: Prepare well in advance. So this one I did announce I would participate, and I was joined into a team this time. So how come I didn’t submit a game at this one? Well the answer was that a game was made, and submitted by the other programmer, LiquidBrewing, the game being Cardboard Giuseppe. However as you can see, no one voted for it, and only two comments, reasons why I’m not so sure. During development there were some issues, namely that one of the artists dropped out (meaning I ended up doing some artwork in order to finish the game up) and it didn’t help that I was away on Friday and Saturday. I guess it wasn’t a surprise that the majority of the code that I wrote never got used in the game. I couldn’t participate in this one, although I cannot find a reason why. I can recall telling people I could not take part because I was going to be away somewhere, but I cannot recall what event prevented me from taking part. Just to show this doesn’t just occur at Ludum Dare, here’s Global Games Jam. I’ve participated at GGJ for three years running and 2014 was the only year that had an incomplete entry. This one had a much larger team of seven people, and yet the reason we never finished was once again, down to tools. We all agreed to use Unity, a great choice if it wasn’t for the fact that most of us never used Unity before, and our venue actually had rooms with didn’t permit the use of Unity (although Unreal Engine was accepted). It was a shame, since we had an idea of an RTS where the visuals and language of the game would depend on what side of a revolution you chose (kinda like Command and Conquer, now that I think about it). On the plus side, I managed to write a sophisticated and fully designed graphical user interface, just a shame the gameplay never became fully realised. I later wrote a post mortem of the jam so you can see the full details of what happened near the time it occurred. Lesson: Use and prepare tools you know how to use. So whatever reasons of this, I’m still taking part in this LD, even if it’s number 34. Whether or not the incidents above are the cause of an actual curse, and these aren’t the only ones, I still enjoy the learning process and hard work I put into making small and quick games every year. I look forward to seeing what cool stuff gets created and I hope, despite already having a planned trip to London…Ah well, going to London to see friends during a Ludum Dare didn’t stop me at LD31! So if I compare with my last entries to Ludum Dare, the average of scores have shown their gradual increase (2.47 – 2.86 – 3.17 – 3.31), and I must praise Lyserdigi for the music to get a such good audio score. Honorary award for catchiest music track in a LD game, this is a very colourful game for such a topical storyline. Music is really catchy and I love the Megaman approach. I love the dialogue and the text options, this is a really neat idea to base the theme on and the design of the monsters are really well made, fitting with the individual characters. Very well made, I like the strategy involved in planning how to overwhelm the player ship to make it lose all its lives. I hope MrTwister expands this to give some more level and boss varieties, since I managed to beat the player after three rounds and the game just looped around. Brilliantly simple and novel concept, definitely liked the level of micromanagement you have to pull off in the later levels. A very well polished puzzle platformer, with a unique jumping mechanic. Really good take on classic movie vampires with a great art style! I remember several months back during the #IndieDevHour on Twitter, someone asked about using Patreon to fund their games development. Back then, Patreon was growing in popularity for independent funding of artists and writers by letting people be regular paying patrons. If you look at the current roll of Patreon Projects, you can see Youtube video producers, bloggers, webcomic creators, podcast producers, musicians and so on, all have a Patreon page. For those content producers, it appears nowadays like it’s a standard form of earning revenue for your work, as I’ve seen some of my favourite online artists and Youtube video creators use the service, both big and small. But what about game developers and game creators, could they use Patreon to help fund their work? Could they fund a portion of their work using the Patreon system? This is what I want to discuss in this article. When I mean game developers using Patreon, I mean specifically using it as a platform to fund their work in creating games, while some have used it to produce games development tutorials such as TheCherno, and others have used it for lets plays, this is about using Patreon for games development like how Kickstarter is used for games development. If you dig deep enough you can find some developers using patreon for developing games. How successful they are is up for interpretation, in the examples I’ve linked some have been moderately successful enough per game/month while others are well below the hundred margins. Why very few developers are using it however? Well it’s easy to say that unlike Patreon, crowd funding sites like Kickstarter and IndieGoGo is both a better marketing and funding platform because a lot of backers use it and people who are successful earn more money. However, I think it’s because of two clear reasons. The first reason is that it’s very new, it only started last year and while it’s growing fast, not all of the large mediums have caught onto it. As such, not every medium knows about it as well as Youtubers, bloggers and short video producers. Asking many of my game developer friends, I found that most either didn’t know or get the Patreon system. Another reason is the ideal scope of projects on the platform, as the majority of creators on Patreon use it for small projects that don’t require a huge budget up front, but a modest budget to sustain the creator to keep what it doing. Mix that with the amount of people actually putting money down on individual creators and you can see that it might not appear to be the most viable option. But on the other hand, Patreon has solved one major problem that crowdfunding sites like Kickstarter is well known for, trust based delivery. Some people remember earlier this year how even after getting funded, not every project on Kickstarter had fully delivered. It’s seen as an understood risk that whatever project you are backing on Kickstarter may take years to fully complete, even if it completes at all. Patreon’s solution is to fund creators for what they have done, and not what they will do. By only paying the creator per project, or on a regular basis, patrons don’t have to feel like they are throwing money away if a creator doesn’t finish a project, and you have the option to reduce or stop pledging a creator (TBC). So let’s go hypothetical on this, what if Patreon, or a similar funding system, takes off and does well enough to be popular and known by many people, and those people are wanting to become patrons for talented creators, how would you go about getting people to be your patron? You could do what’s currently being done, and have patrons pay per game. However that is only viable if you produce regular content, and that requires developing several small games on short development cycles, instead of producing one or two large games over a long period of time. So why not use that ideal environment to work with Patreon? Some content creators work really well on a monthly basis, while producing content on a varying basis. This could be done with games by having a game being funded by patrons while in beta, where the patrons themselves can have some or full exclusivity towards testing and contributing to the game before release. I can see that model working especially well towards online multiplayer games, where the patrons themselves can act as a small growing fanbase by interacting with each other. However, what Patreon needs is for time to grow and people to be aware of who they are and what they will do, and maybe we will find more game developers on there and show more creative ways of using a patron system.